Hi! Darlene Franklin here. As a child, I enjoyed visiting Fort Western in my home of Augusta, Maine. It enjoys prominence as the "oldest surviving wooden fort" in the United States. It also has a certain notoriety as the staging point for Benedict Arnold's invasion of Canada at the beginning of the Revolutionary War. In spite of his lack of respect for the chain of command, especially under men who were promoted over him, Arnold was an able officer. Massachusetts commissioned him to attack Fort Ticonderoga on Lake Champlain. Unfortunately for Arnold, Ethan Allen and his Green Mountain Boys received the same commission from Connecticut (Vermont was "New Connecticut" at one point in its history). Allen claimed the victory of the battle and Easton was made commander of the fort. Arnold kept pushing for opportunities to prove himself. George Washington respected him, and gave him the task of invading Canada. The troops got a late start in the season, and anyone who has lived in Maine knows how cold it can be during the winter. He kept his men together in spite of the harsh conditions, a feat that rivaled Washington's impact at Valley Forge. But his best efforts couldn't fight desertion, smallpox, and end of subscriptions for the soldiers. His letter requesting reinforcements reached the British instead. Left with a fighting force of only 600 men, he was praised for showing to the fight. They didn't win. Arnold received a bullet to the leg during the battle of Quebec. He continued to serve, and a later victory against Burgoyne helped to convince France to come to America's aid. What brought about his ultimate downfall was a woman. He married a wealthy heiress and attempted to maintain her in the lifestyle she was accustomed to. If that meant cheating the Continental Congress out of a few dollars. . . Even that debacle didn't end Arnold's career. Washington offered him a plum assignment: West Point. And Arnold attempted to hand it over to British, earning the name of traitor. This month my story of Revolutionary Vermont, Prodigal Patriot, is on sale for $.99 in ebook format from Amazon and other outlets. It covers the second battle at Ft. Ticonderoga. GIVEAWAY: I will give one copy of Hidden Dreams, the fourth book about Maple Notch (Prodigal Patriot is book #1) for every 10 comments left today. Winners will be chosen on Sunday, June 16th. I hadn't heard the whole story on Arnold. Thanks for sharing! These books sound great! Thanks for the chance to win one! I didn't know about Benedict Arnold's wife, and to be honest, had forgotten most of what I knew about him! Thanks for the refresher! I didn't know about his role at Ticonderoga, which I enjoyed learning more about. I did not know about his wife. In my history classes, Benedict Arnold wasn't one of the men in the past that the professors taught. If his name was mentioned it was briefly. Thank you for sharing this wonderful information with us. Hi Barbara, I always had a special interest in Arnold because of his connection to Maine. I don't think I've ever heard about Benedict Arnold's military career before. Interesting info. One thing that really caught my eye was the name Ticonderoga. My dad was in the Navy during WWII and the USS Ticonderoga was one of the ships he was on. Thank you for the interesting blog, I love reading about this time period. You write colonial, don't you, Winnie? Oops. I remember reading it and enjoying it, but the details escaped me. My face is red. Wow, he had a great history, didn't he? Too bad the basics of trying to keep his wife happy were his eventual downfall. We definitely don't learn those specifics in school. Thank you for a great post! It was fun learning more about him. So many little details we never have heard before. Thanks for the giveaway. Wow, I never knew the story about Benedict Arnold. And wouldn't ya know it'd be some spoiled chick to cause his downfall! Haha! Bless his heart, I sure do hope she loved him with all the love and respect in the world and didn't "dump" him after that! Thanks for teaching me something new today. There was a lot more information, but mostly about battles (which I largely ignore, lol). Fascinating man. Hi Maxie, maybe you can get someone else to come visit! Oh wait a minute, I'm commenter #20. Thanks for entering me in your giveaway. I enjoyed reading your article and I love to learn something new. Thank you for this giveaway and the history lesson. Can't wait to read Hidden Dreams. Wow, interesting..didn't know that about him...thanks for the chance to win. I really enjoyed this post, Darlene. We visited Old Fort Western a few weeks ago and had a wonderful time there. I can't believe I've lived in Maine for 11 years and have never been until recently. 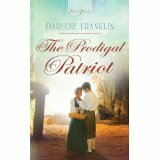 Love that book, Prodigal Patriot! Hi there folks! I'm a little late in announcing that Betti is the winner of Prodigal Patriot!